This is the third, and possibly the last, in a series of blog posts on my experiences migrating data from a working Access/SQL Server database to SharePoint, where it now serves me daily. It's a "hybrid" database, in the sense that the Front End is the original Access accdb, complete with all of the original VBA intact, while the Back End lives on SharePoint. 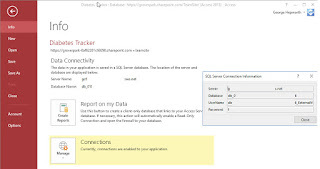 In my last previous blog post, I described one of the problems with exporting existing tables from Access or SQL Server to SharePoint. SharePoint bumps the existing Primary Key field out of its way and replaces it with a new one which SharePoint generates in its place. Here’s how that looks.